When citizens of Gradec received the "Golden Bulla" in 1242. which proclaimed "a free royal city on Gradec, the hill of Zagreb", one of the hardest commitments was that they had to build strong walls around the city. They fulfilled that commitment and between 1242. and 1266. strong walls with several gates were erected. Some parts of the walls and the Stone Gate are the only parts preserved till today. How the Gate used to look originally is unknown, the only thing that is known for sure is that they were made of stone in a city where wood was the main building material. The oldest document that describes the look of the gate dates back to 16th century: it was an open building with no roof, with a tower in the north-west and a bridge over the dike. It was roofed in 1555. Other gates were: Mesnicka Gate in the western part, Opaticka or New Gate at the end of Opaticka Street, the gate under Friar's Tower (also called "Frauentor" - Woman's Gate, due proximity to a convent), and small gate "Dverce" in the southern part. History of Stone Gate is by far more interesting than any other. It is sure that Stone Gate exists since 1266. despite the first mention dates only back to 1492. In 17th and 18th century, Stone Gate was damaged in fires four times: 1645., 1674., 1706. and 1731. The city was mainly made out of wood and fires were a frequent occurrence. During the last fire (in 1731. ), Stone Gate was damaged badly but one painting remained intact - the painting of Virgin Mary with baby Jesus. Widow Modlar, the owner of it built a chapel inside of Stone Gate where it still stands (named "The Virgin and Child"), guarded by an impressive baroque fence, built in 1778. by craftsman Ivan Korta from Zagreb. Author and age of the painting are unknown, but it is a common opinion among experts that it is a work of a talented native artist. The painting shows Virgin Mary as a ruler with a sceptre in her left hand and baby Jesus in her right hand, while Jesus holds a small globe in his left hand. It was painted on linen, sized 57x47 cm. On the 200th anniversary of its miraculous preservation in the fire it was crowned with a golden crown. Long time ago, Virgin Mary of Stone Gate became the most significant oath site, where pious find comfort and hope, light candles as a token of gratitude or a prayer. Many citizens of Zagreb got their prayers answered to, and plates with engravings of gratitude stand as a testimony. During centuries you can hear people in Zagreb saying: "I'll light a candle in Stone Gate if Virgin Mary hears my prayer." Such words are not a figure of speech, you can see it every day in Stone Gate, where citizens of Zagreb stop by, light candles and pray for health, happiness, good luck and love. 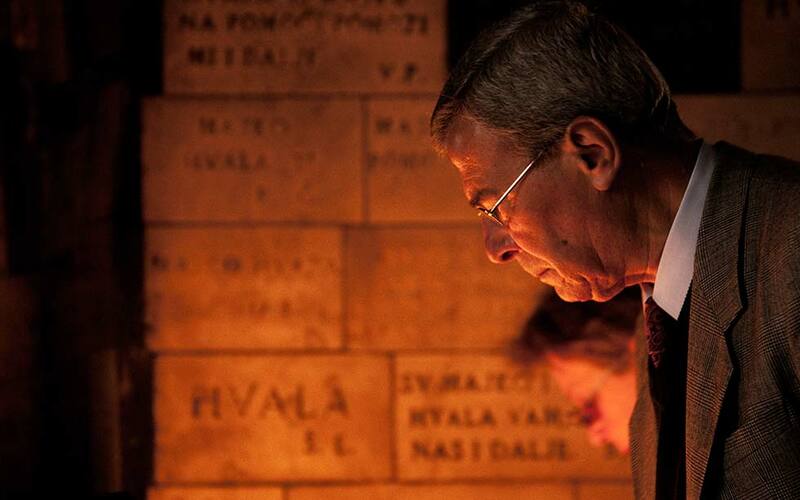 Even in the times when praying publicly was forbidden, citizens of Zagreb continued visiting the Stone Gate, which testimonies the significance of the Gate in everyday life. On May 31st 1991., 260th anniversary was celebrated and archbishop cardinal Franjo Kuharic named Virgin Mary of Stone Gate the protector of Zagreb. In 1841. an idea appeared that the Stone Gate should be demolished, because "making the city happier with a bigger ornament and providing comfort and safety to public using that passage..." Preliminary contract between city council and trader Daniel Jaksic (living next to Stone Gate) was made, which stated that Stone Gate should be demoished. Plans for new gate were made by Felbinger (plan wasn't saved) and Kappner who imagined it in classicist style, merging functions of a passage, trading building and a chapel. Fortunately, the contract was never signed. About 30 years later, same idea that Stone Gate should be razed appeared again. In "Vienac" newsletter, Isidor Krsnjavi (influential Croatian painter, art historian, curator and politician) opposed the idea writing: "Let us not raze antiquity! ...Domes, gates, towers of city and church are the most adequate means to profile cities..."
"...Stone Gate and church of St.Mark are only significant monument buildings of our city, which stand as a living testimony to past times and free royal Gric city, predecessor to Zagreb. Elsewhere, monuments as these are preserved, returned to original form, so citizens could experience its wisdom and past..."
At the beginning of 20th century, same idea appeared again. Fortunately, Stone Gate got a new function. As proposed by Knight's Order "Brethren of the Croatian Dragon", in Stone Gate three significant establishments were found: City library, History archives of Zagreb and Zagreb city museum. Bit past the gate, on the left side a statue of Dora Krupiceva is located in a niche, made by sculptor Ivo Kerdic. Dora Krupiceva is a beautiful heroine from a novel "The Goldsmith's Gold" written by August Senoa, one of the greatest Croatian writers. In the same street (Kamenita street), an oldest pharmacy in Zagreb is located, working continuously since 1355. "As pharmacist, since 1399. Dante's (note: Dante Alighieri, writer of Divine Comedy) grand-grandson Niccolo works in it (in the pharmacy). It is familiar that he was married, so he lived in Zagreb with his family. Niccolo is a grandson of poet's first-born Pietro." On the other side of the street, as opposed to the pharmacy, on a small terrace stands a stone lion, and underneath, between two columns, chains which held Nelson's admiral ship "Victory" after the Battle of Trafalgar. So the legend says.